A proud not for profit organization dedicated to promoting, enhancing and facilitating businesses for our members and the communities for which they are in. Members of the Conception Bay Area Chamber of Commerce may avail of a wide range of benefits. Membership is open to all businesses, professionals, and stakeholders who are involved in trade and commerce. We advocate for the business community and on issues that affect you, at the local, regional and national levels of government. We host a variety of events to help you meet or reconnect with other Chamber members. A great way to mix business with pleasure. Our M2M Pilot Program launches Summer 2019. Keep business in our community by advocating the importance of members doing business with members. Members can take advantage of our preferred and discounted rates for professional development and other training sessions. 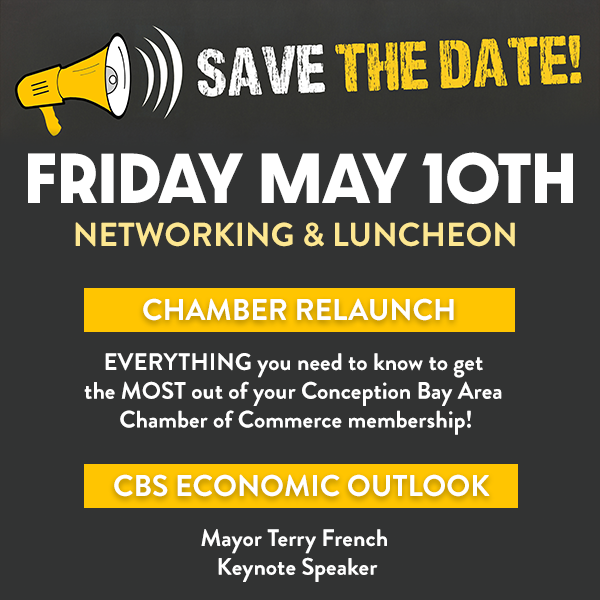 The Conception Bay Area Chamber of Commerce is the principal organization representing economic and business interests in the Conception Bay Area from Paradise to Marysvale. The Chamber is the recognized business community voice on matters of significant economic and business interest. In existence for over thirty years, its primary mandate is to enhance opportunities for members to improve their ability to do business. Are you a current or potential resident of the Conception Bay Area? Learn more about the community by visiting our resource page. The Conception Bay Area Chamber of Commerce is proud to connect new and existing residents with reputable local businesses providing quality goods and services. We believe in the power of membership and community.